As you know, I recently returned from a very fun work trip to the UK, with stops in London, Rochester, Havant and Birmingham. I came home a little early, to help with all the flood communications for my company, but while I was there, especially the first leg of the trip, which was focused in London, life was good. It’s long been comedy fodder that England has terrible food and terrible weather. For me, Big Hungries, this was not the case at all. In fact, I lugged wellies and a raincoat all the way across the Atlantic and never really used either. The sun shone most days, and I didn’t have a single meal I wasn’t happy with while in Merry Ole’. My first evening in my posh hotel, The Royal Horseguards, I wrote in my food diary: weary, but happy. I was much too tired, after flying all night in a window seat next to a woman who actually requested that I list for her all the plastic surgeries I thought she might need to look 39 again, then meeting my colleague and working in the afternoon, to venture out to any sort of real dining establishment. Instead, I donned the fluffy bathrobe provided in my room, found Holly Oaks on BBC (England’s answer to The HIlls, from what I can surmise), and ordered cream of tomato soup with basil, parmesan and olive, and chicken liver parfait with crusty bread and veggies. Ah, the life! 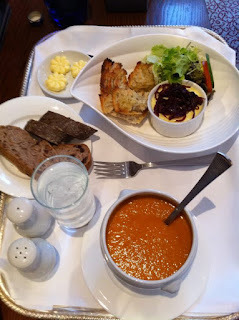 I luxuriated in the velvety soup, rich with cooked-down tomato flavor and the salty edge of parmesan, as well as the unctuous, resplendent saltiness of the chicken liver pate, which was topped with a crown of caramelized red onions. This is not a meal you would want with any real frequency, but it was soothing and filling, and after all the moving and shaking my travel had subjected me to, it was like a balm. I saved the raisin bread from this and had it for breakfast the next morning. So economical! I forgot to mention that earlier in the day, my co-worker guided me to a cool little food shop in the train station called Camden Food Co., where I got a completely virtuous and completely tasty lentil salad with tomato, mozzarella, arugula and cucumbers. I also had an arugula salad at the Italian place I’ll be telling you about a paragraph or two from now. I’m happy to report: arugula is my new fav ingredient, and this lentil salad thing captured my fancy so much so that I made it last week and brought it as lunches into work about four days in a row. I found that these convenience stores – both quick-service ones like Camden but also packaged-food pit stops like Marks & Spencer Simply Food - are much more prevalent in London than in the states, and the variety of convenience foods they carry is astounding. Maybe it’s that Brits have smaller kitchens or are just too busy to cook, but whatever the reason, they made grabbing yogurt, fruit, water and other healthy treats really simple for me while I was there. My second day in London, after a really good night’s sleep, I worked most of the day from my hotel room. Still trying to preserve some healthy eating whilst abroad, I walked the four or five blocks down to Trafalgar Square at lunchtime and stopped at what I thought would be a terrible pizza place, Pizza Express. I love it when I’m wrong in the best possible way! I ordered a thin crust pizza with the middle of the pie cut out and filled with spinach salad – what they call Leggera Pizza. My prosciutto, pepper and shroom pie was filled with spinach and tomato salad in a slightly sweet vinaigrette. I heaped the salad on top of each half slice (because the middle was cut out, each slice of pie was sort of missing the end) and enjoyed the whole thing immensely. That night, my co-worker took me to one of her favorite dining hot spots in London, Shepherd Market. Out of all the sweet little restaurants nestled in this classic London neighborhood, we chose Da Corradi for our dinner. We made a good choice! It wasn’t filled with tourists, but with bona fide locals, and the food was excellent, even if the service was a little more leisurely than I would necessarily prefer. You know I couldn’t resist the carbonara – it had been at least four full hours since I’d ingested pork! And this carbonara was excellent – very close to what I would make at home, with a nice, tight, egg-enriched sauce jam packed with pancetta and romano cheese, with perfectly al dente pasta. This is good destination if you’re in London for a few days and want to eat something other than just British food – Shepherd Market also has Iranian, Lebanese and French restaurants, and some very British pubs in which to grab a pint after your meal. I also tasted the best damn prosciutto I have ever had, from an Italian purveyor at the market. The prosciutto and mortadella I sampled at that booth tasted like sunshine…like a sunny barnyard full of clean hay and happy animals. OK, maybe you don’t think a barnyard could taste all that great, but I’m telling you, it was like the taste of these meats transported me entirely. Simply amazing. Another don’t miss is Neal’s Yard Dairy, off on one of the little side streets, where they let you sample real English cheddar for free. Aged, dry, salty and delicious, I say. Next day, my friends Traci and Vinnie, who have been ex-pats in Havant, UK for about three years now, took me on the most fun adventure of my trip, to see Stonehenge, Winchester Castle and Cathedral, and their favorite tea shop near Havant. 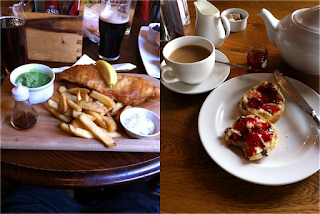 I was just about as happy to finally get the coveted fish and chips and mushy peas in a proper pub in the countryside. The fish and chips were excellent – mostly owing to the extraordinarily flavored fish that was beer battered and scrumptious. I’m not sure I’ve ever had simple fried fish this good in the states. The mushy peas, which I had anticipated greatly, were lovely – somehow more than the sum of its parts, yet still just plain peas, mushed up. I was happier than a kid on Christmas morning with this meal. The cream tea, which is your own pot of tea with a scone, clotted cream and jam, was also more than the sum of its parts. The scone, cream and jam are a harmonious trio that far exceed what this would taste like if the cream were substituted with butter. I tasted clotted cream on my previous visit to London and didn’t care for it, but I don’t think I was pairing it with a scone. It’s a full mouth feel that we don’t often allow ourselves in the states – a decadent treat that you shouldn’t pass up. Some other time, I’ll tell you about the two dinners enjoyed on the second leg of my trip, up in Birmingham. They were good. But this post is getting kind of long, and I don’t want to abuse your good humor with my endless ramblings. 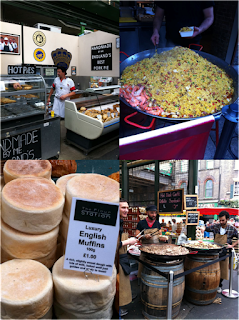 In summation, I will underscore the notion that travel expands your culinary horizons – it really does! I wanted to go to London and try all the traditional tastes of that place. I did that, and more. I grooved on the tiny little sautéed mushrooms at breakfast, the arugula or “rocket” salad with shaved parm and a drizzle of balsamic, the afternoon ritual of hot tea, and dashing into M&S for a snack. And this is what travel does – it gives you a glimpse into other lives and other worlds, without having to change your life in any permanent ways. But beware, it does change you. Just look to the box of tea now in my desk drawer, the bag of lentils in my pantry and the arugula in my crisper, and Bob’s Your Uncle, you know I’ve changed. My personality is big, my hunger is bigger!